Earlier last week Black Rat Projects announced that their next exhibition at the gallery space would be a solo installation by New York artist and long term Black Rat collaborator Swoon. 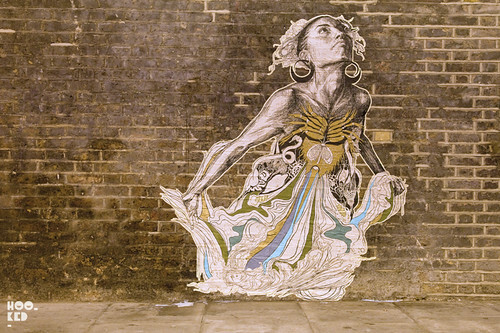 We were delighted to hear this news, as Hookedblog are massive fans of the artists work and we have been waiting for a full scale Swoon installation to come to London. Well it looks like Swoon is already in London town. We were super excited to stumble on this beautiful new street piece from the artist on our way home last night. Hopefully it's the first of many! The ‘Murmuration’ installation is set to open on December 2nd. Further details will be announced shortly. We headed back this morning to capture some daytime shots of this Swoon piece but unfortunately it looks like Hackney Councils buff team beat us to it and have have already removed this piece. where in london is this located? The piece is pastedin East London not too far from Black Rat's Gallery space. bugger. I cycled around 8 likely bridges with the necessary virgin walls (i.e. not rivington st!) looking for this today! The buff has always been consistently tolerant of Swoon's work. Before they contractorised it the council buffer once told me he could tell Swoon and Elbow Toe was "real art" and he deliberately left them. More likely to have been an opportunist thief i wonder.